I LOVE YOU! I have been looking for this pattern and had no idea where I had seen it! I was planning on using them for DD fundraiser, which the author has been nice enough to let us do, to go along with the dish cloths I’m making. Yours are so bright and happy looking! Thanks for the tip about the gathering! Very nice. Putting them in my queue. Those are awesome! What a clever way to use up yarn scraps! I LOVE the baby hat too! I had seen this pattern once before and couldn’t find it again either! Now that I have cotton in my stash, I’ve been wanting to do more scrubbies. Thanks for the link! I love the colors you used! They remind me of springtime, which is just around the corner (I hope!). I’ve made that spiral baby hat too. Defiitely easy and fast! Thanks for the links. This is a great pattern for scraps. Wow, love these. (I thought I had already commented but I guess not so if you get double comments from me, I apologize). I have tons of yarn sitting around and think I might have to make some of these. They’d make good presents for the in-laws. This is very interesting…what on earth do you do with them? Do you clean the dishes with them? Does it just make a mess? Is there some sort of stuffing inside? I just love these little scrubbies and posted them on my blog with a link back to you here. My cotton yarn is just hollering to be made into these little cuties. Had to go look at the hat too and it is precious. Thanks for sharing! Thanks for posting this! I too was a scrubbie pattern loser! LOL I pretty much memorized the pattern and have been making them out of regular acrylic. I made them with the cotton and found them to be slimy. The acrylic works as a great scrubber! Help! I found the instructions yesterday, whipped out yarn and hook, made the diamond shaped piece — but then couldn’t figure out how to slip stitch the first and last rows together. Do you have to fold them or twist them in some way? They don’t line up. Is it just one slip stitch or down the entire row.? I am completely confused, but would really like to make these. They are cute. I agree but, what do you use them for? Really, what do you scrub with them? If I make them for my friends and family I want to be able to tell them how useful they are. I too have tried to form these. Love the look but have trouble with getting them into the circle. I wish someone would do a video tutorial for these! I can’t, for the life of me, get them together right.! I ALWAYS WANTED TO MAKE A BEAUTIFUL SCRUBBIE, BUT NEVER FOUND A PATTERN UNTIL TODAY. THANK YOU FOR NOT ONLY GIVING THIS PATTERN TO ENJOY BUT FOR THE TALENT YOU HAVE TO SHARE. I AM A VERY PICKY PERSON WHEN IT COMES TO MAKING ANYTHING. YOUR PATTERN IS VERY EASY TO FOLLOW. I LOVE TO MAKE PROJECTS THAT HAVE THAT PROFESSIONAL LOOK AT THE END. YOU SHOULD WRITE A BOOK WITH THESE PATTERNS I KNOW YOU HAVE THE TALENT. ONCE AGAIN THANK YOU SO MUCH. I made a variety of these in nylon plastic canvas yarn and they work awesome and they don’t get an odor like cotton yarn sometimes does…Love the pattern…simple and they work great as scrubbies or little washers…. Hi there. I just found your tawashie rosebud scrubbie!! It’s awsome!! But I could not find the pattern. Is there anyway you could email me the pattern or provide a link to it? Thanks in advance for your time. Sherry, click on the underlined word “scrubbie” the pattern comes up there. Sorry I had to hurt for it the 1st time too. I just wanted to let you know.. I do half of these in nylon plastic canvas yarn and half in cotton for a built in non abrasive scrubbie. I don’t know where on your page to find the pattern for this. I looked at your slide show — they’re WONderful!!! Click on the word Scrubbies and it will open to the pattern. because i am elderly and on a limited budget..and not well computer savy.. I hit on your site and on the tea cozy’s and scrubbies.. I hit print and all I got was a picture and lots of peoples comments… I am heart broken what good is all this if I can’t make them due to NO pattern. Besides tons of my computer paper was wasted with printed out commnts I did not know I was getting and do not need. this has happen a few times now and I guess i will just have to dump and give up..
AGAIN this is so hard to find and the person who posted this should have made it more easily to find the actual pattern!! I’ve attempted to make this scrubbie, but when I sew the ends together then pulled up the centers my scrubbies do not seem to look like they should. The outside looks weird and they won’t flatten. I LOVE these scrubbies! Thanks so much for posting it…. Can’t wait to make some and try them out…. What a lovely find! 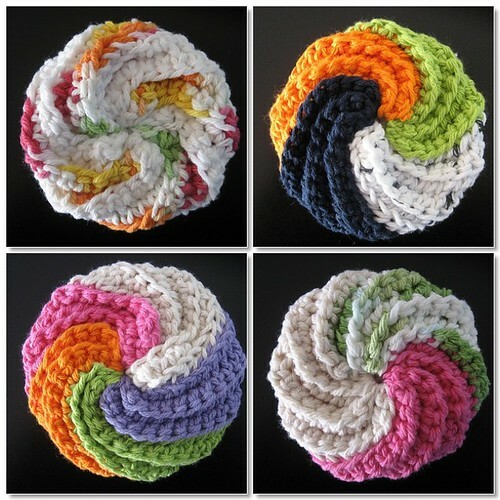 Made many spiral scrubbies in different sizes. Had so much fun. The video clip on youtube was a big help too. I see the pix of the scrubbie for the Tawashi Rosebud, but where is the pattern. Please email me a copy of the pattern. thanks. I love the scrubbies. I can’t find the patterns.How do I get them? Please email me. This worked up so fast but when I sew the ends, etc, it comes out “wonky”! Still will use it but it is not centered liked yours. The center hole is completely off to one side. Any advise for my next one? 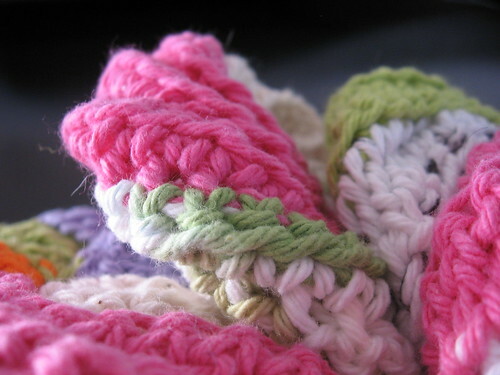 Love the look of the spiral scrubbies…how do I get the pattern? Finally found your pattern….can’t wait to make them. For those who (like me) are having trouble understanding how to get the final shape I found a youtube video explaining the pattern. This is a great video. Thx for providing. All of your links seem to be dead! Things change, don’t they? Did you just alternate the colors by changing colors every few rows? I love that its in english i was getting tired of all the asian directions. Just love how these idjits put up a poorly explained pattern and then never come back to answer questions from confused crocheters. Jerks!